Teachers are being trained to carry guns in classrooms in Colorado in order to protect children as part of a scheme motivated by a school massacre in 2012. The three-day course, which consists of firearms and medical training, was launched on Tuesday in Weld County. Seventeen members of staff who "would like to be considered armed first responders" have so far taken part. The pilot programme will allow volunteers to enter schools with guns under US "concealed carry" laws. Teachers were taken to a shooting range in Weld County, near Denver, where they were tested on their abilities with weapons. 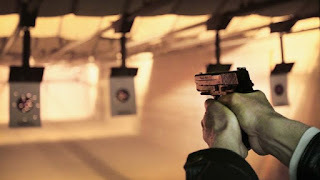 The course, provided by the Faculty Administrator Safety Training and Emergency Response group (Faster), was set up by parents, law enforcement officers and medical experts who believe that US schools are a "soft target" for violence. The group refers to schools as "victim zones". Faster's aim, it says, is not to replace police or security services, but to "allow teachers, administrators, and other personnel to stop school violence rapidly" and to "administer medical aid where necessary". The group was set up following the Sandy Hook shooting massacre in December 2012, in which a rifle-wielding man killed 26 people, mostly young children, at a Connecticut primary school.